The hall is situated right in the centre of Moreton adjacent to a large car park where the tourist buses stop. Although on 2 floors we currently only use the ground floor of the building. 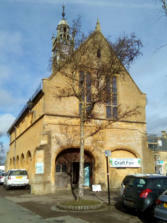 The hall is situated right in the centre of Chipping Campden adjacent to the centre car park where the tourist buses stop. We currently only use the top floor of the building. Most weekends downstairs is used for antique fairs. A large Hall situated on the main pedestrianised High Street. Parking and unloading at the rear of the building via an access road off Copenhagen Street. A large Hall situated straight off the main street. We share this venue with Three Shires Craft Guild. Situated by the entrance to St John the Baptist church.